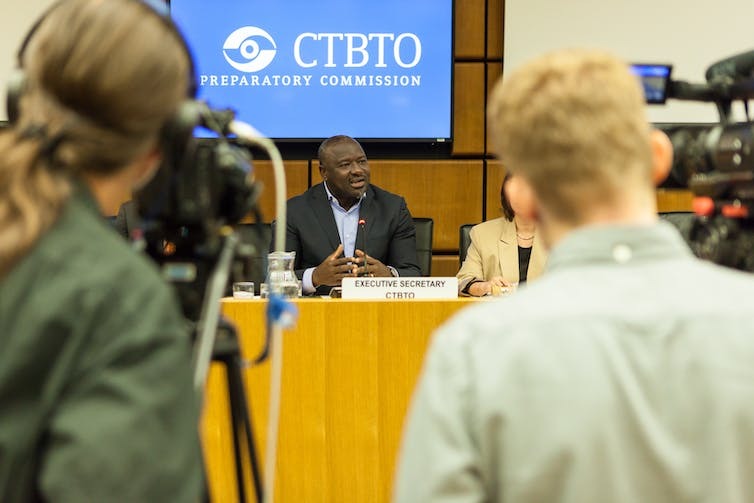 Lassina Zerbo, Executive Secretary of the CTBTO at a press briefing following the recent suspected nuclear test in North Korea. North Korea’s apparent nuclear detonation on September 3 has drawn our attention to a remarkable international organisation that helps detect and identify nuclear tests. For the Vienna-based Comprehensive Test Ban Treaty Organization (CTBTO), the latest North Korean explosion was easy to detect and locate. With a seismic magnitude of 6.1 and a blast yield of 160 kilotons (Hiroshima was around 15), the purported hydrogen bomb test mimicked a major earthquake. It was quickly sourced to North Korea’s nuclear test site. Confirming that the event was definitely a nuclear test, as opposed to another type of explosion or an earthquake, is trickier. Read more: King Jong-Un’s nuclear ambition: what is North Korea’s endgame? For that we rely on detection of short-lived radioactive isotopes that may leak from the test site, notably the noble gas xenon. The CTBTO has not yet announced such a finding, although South Korean monitors have reportedly detected xenon-133. Other potential sources of the gas must be eliminated before a definitive conclusion can be reached. 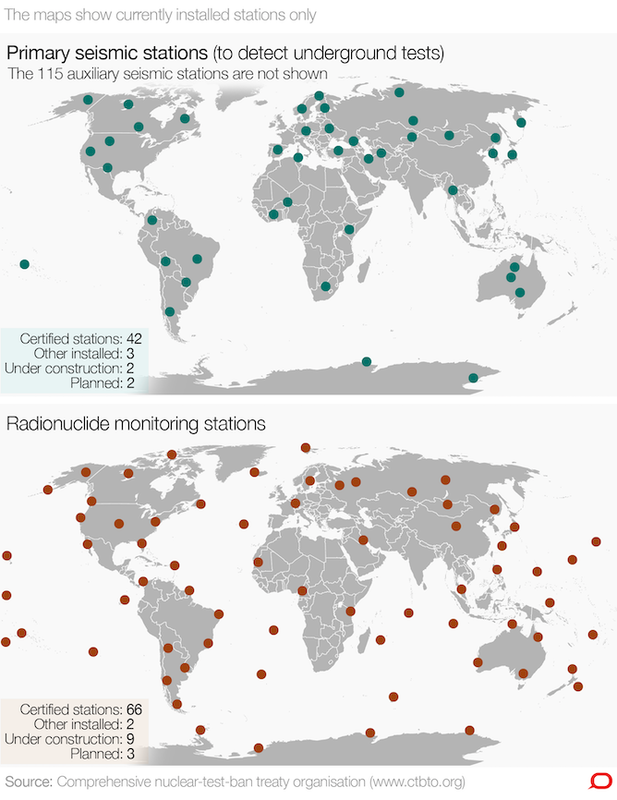 Global network of seismic and radionuclide monitoring stations. In the past, such fallout has usually been discerned after a North Korean test, but not always. Much depends on whether the cavity created by the test leaks or collapses. 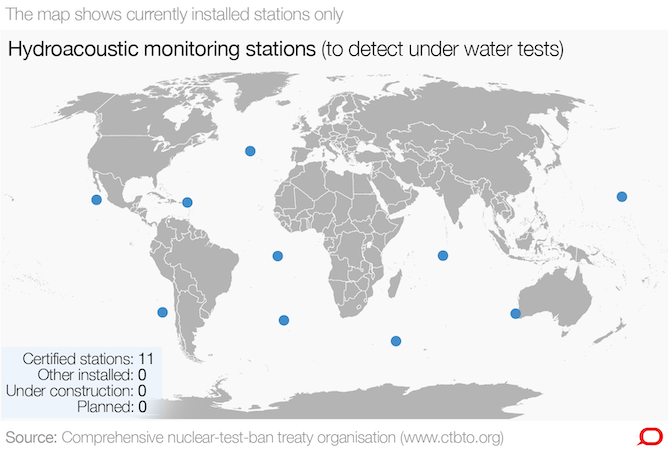 The CTBTO’s International Monitoring System, which detected the North Korean test, is designed to verify compliance with the 1996 Comprehensive Nuclear Test Ban Treaty, which bans all nuclear tests in all environments for all time. Network of infrasound monitoring stations. infrasound – for atmospheric tests. 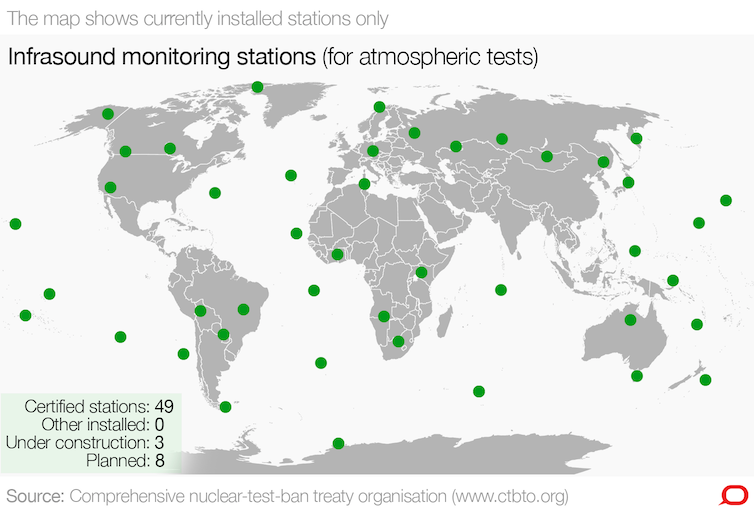 The CTBTO’s international monitoring system is sensitive enough to detect underground nuclear tests below one kiloton. Construction of the system began in 1996 and is now 90% complete. Network of hydroacoustic monitoring stations. 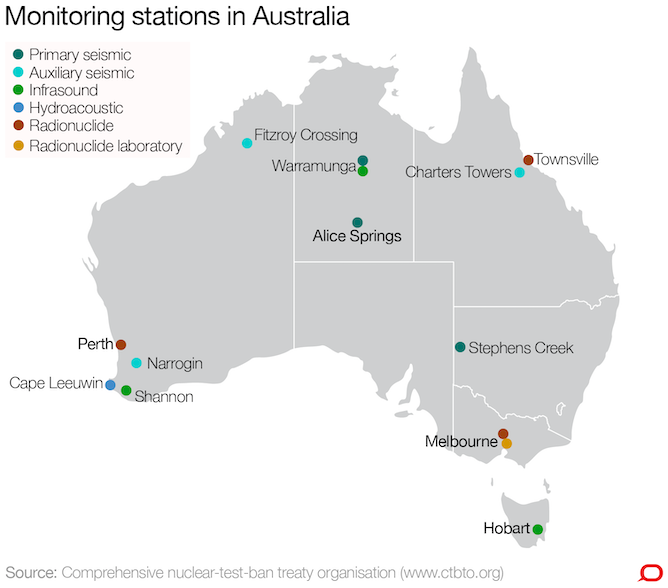 Australia hosts six seismic, two infrasound and one hydroacoustic station, including a large seismic array and infrasound station at Warramunga in the Northern Territory. Data from the International Monitoring System is transmitted to Vienna via a global communications satellite network, mostly in real time, where it is compiled, analysed and distributed to member states. Sixteen laboratories are available for analysing radioactive fallout. The treaty also provides for on-site inspections to confirm that a nuclear test has been conducted. The system is funded by member states according to the usual United Nations formula based on national GDP. As a member of the Australian delegation, I observed the complex preparatory scientific talks on the system at the Committee on Disarmament in Geneva in the early 1980s. It is a miracle of statecraft and science that this collaborative international infrastructure has actually come into being. The scientists did not get everything they wanted due to political and financial constraints. Some errors were made in the rush to complete the technical specifications. Installation of some of the stations in remote and inaccessible areas has proved daunting. The hydroacoustic system, for instance, passed a significant milestone in June when the final station was completed, on France’s Crozet Islands in the southern Indian Ocean. After 20 years of planning and construction and the investment of millions of dollars, not only is the International Monitoring System almost complete, but it is functioning far better than its designers anticipated. It also has unexpected side benefits, such as providing early warning of tsunamis and detecting nuclear disasters. The network successfully detected the 2004 Indian Ocean tsunami and tracked radioactive plumes from the 2011 Fukushima nuclear disaster. The test ban treaty itself is not in such good shape. More than two decades after it was opened for signature it is still not in force, rendering the CTBTO only “provisional”. This is due to the requirement that all 44 states with a significant nuclear capacity must ratify it. Currently 183 states have signed, and 162 have ratified. But 8 of the 44 with a nuclear capacity have still not ratified: China, Egypt, India, Iran, Israel, Pakistan, North Korea and the United States. China, Egypt, Iran, Israel and the US have at least signed. China says it is awaiting US ratification before it moves. After a flawed lobbying effort, President Bill Clinton’s administration failed to secure Senate approval for US ratification in 1999. The treaty has not been resubmitted since, despite President Barack Obama’s undertaking that he would try. Given President Donald Trump’s apparent focus on emphasising American military prowess, it seems unlikely that he will favour ratification of the treaty. More immediately threatening is the return of periodic Republican attempts to defund the CTBTO. These are usually beaten back on the grounds that the US benefits greatly from the worldwide monitoring that only a global system can provide, notwithstanding impressive US national capabilities. As it has in the past, the Australian government should make representations in Washington in support of CTBT ratification and preservation of funding for the system. Paradoxically though, even if the other seven holdouts ratify, the one country that continues to conduct nuclear tests into the 21st century, North Korea, can stymie entry into force forever. Its accession to the CTBT should be part of any negotiation with North Korea on its nuclear program. The good news is that the global monitoring system continues to go from strength to strength, providing reassurance that all nuclear tests, including those less brazen than North Korea’s, will be caught. The CTBTO’s verification system provides hope that science can quietly triumph while political solutions elude us. The link below is to an article reporting on an al Shabaab bomb attack on a church in Kenya. The following article reports on the latest news of persecution in Nigeria, where Islamic extremists from Boko Haram have bombed another three churches. The following article reports on the latest news of persecution in Pakistan’s Punjab Province, where a Christian graveyard is being lost to corruption. The following article reports on the bombings of Christian churches by Boko Haram and alleged military involvement. The following article reports on the continuing persecution of believers in Iran and the closure of a church in Tehran. The following article reports on the bombing of the St. Finbarr’s Catholic Church in Jos, Nigeria. The bombing was carried out by the Islamist extremist group Boko Haram. The following article reports on how Iranian authorities have closed down the last two Farsi-language church services in Tehran. The following article reports on how the Islamic extremist group Boko Haram set off a car bomb outside of a church in Nigeria. The following article reports on how the Indonesian government is failing to enforce a Supreme Court ruling that allows a church to worship inside its own building. The following article reports on unconfirmed reports that Iran is set to execute Iranian pastor Yousef Nadarkhani. The following article reports on the car bombing of a Church of Christ in Nigeria (COCIN) worship service in Jos, Nigeria, by Boko Haram Islamic extremists.